Quick question for anyone with an Intel CPU and discrete GPU - do you still have to use bodges in order to use QuickSync with a discrete GPU installed or is it easier to do now? I've tried QS myself recently on a Skylake i3 and while it's very fast, for a given RF the files are huge compared to x264, which is in line with benchmarks I'd seen previously. So while it's probably great for realtime stuff like streaming without maxing the CPU cores, for most non-realtime uses I think I'd prefer to stick with a good software encoder. WRT Phenom II X6, isn't that a lovely die shot? Is that from the era when they didn't photoshop the die shots? Interesting to see all the love for the Phenom X6 in here. Have only used Phenom II X4 chips, but was considering swapping my wife's X4 965BE for a FX 6300. IIRC the X6 is fairly unique amongst desktop CPUs in that each core was on its own clock plane. On modern Intel CPUs all cores are on the same clock plane, but can be selectively gated for when turbo is used (something the X6 can't do). I wonder if this design was partly due to die size? I imagine distributing the clock across such a large die would have been a challenge, and uncoupling it by having each core on its own clock would have made clock distribution more practical I guess? Plus AMD presumably went with the resonant mesh in later designs, but I think at least Zambezi still used asynchronous clocks. It's a bit worrying AM4 is MIA. It also means the Zen APU is also delayed by extension. Even with Polaris,it has been delayed enough for Nvidia to have an answer. What has happened to the old ATI and AMD?? They keep delaying products and it gives Intel and Nvidia an easier run! I don't think a Zen APU was planned until 2017 anyway? As I understood it the launch vehicle for AM4 was an Excavator-based APU with a Zen CPU coming towards the end of the year. 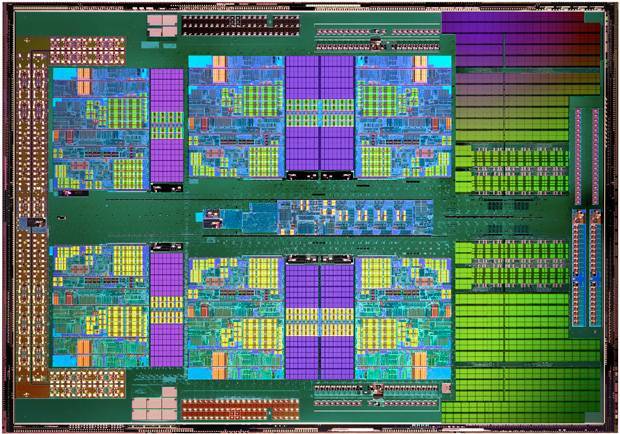 As long as it's out in time for that it shouldn't be too much of a problem - the first APU was a 28nm one similar to Carrizo we've already seen on the mobile side anyway (and on AM2+ if you count the Athlon). Same with Polaris, I don't recall hearing it would be ready until around the middle of the year? Yeah,but I don't see AMD replacing Bristol Ridge on the desktop in under a year and the Zen APU was sometime next year. The longer and longer they delay AM4,it increases the chance AMD is competing not against Broadwell or Skylake IGPs and CPUs but Kaby Lake ones. Plus,it also means it decreases the time that the AMD Zen APU can compete with 14NM Kaby Lake too - it pushes it closer and closer to 10NM Intel CPUs. This is a constant issue with most modern AMD CPUs - the delays are what makes them even more uncompetitive. It could be that they are obsessed to try and sell FM2+ stock at a decent price,but in the longterm delaying AM4 for FM2+ is just a retarded strategy. For short term gains,they are making their products look less competitive longterm. Plus newer CPUs and a socket with an actual longterm prospect of CPU upgrades,would mean more people would pay MORE for an AMD setup. It would not surprise me if we don't see Bristol Ridge before July or August at this rate. I also don't think we will see Zen this year for the desktop actually for sale. Even with Polaris we have seen AMD demoing the chips for months,but instead of trying to get these out,it increasingly looks like AMD has been beaten to the launch by Nvidia. Now,AMD might get more OEM contracts but in terms of mindshare it does nothing for AMD as a brand,and that affects its perception in the OEM space too by customers. The OLD AMD and ATI got CPUs and graphics cards out in a timely order - Athlons beating Intel Pentium 3 and 4 chips to launch and even cards like the 9700 PRO and HD5870 doing the same to Nvidia. AMD,is just delay,delay,delay and its affecting not only the perception of their products and how they are positioned in the marketplace with competitors which are considered to have superior marketing too. AMD cannot actually release products on time at all. In the end they need to get that into that heads. Last edited by CAT-THE-FIFTH; 02-05-2016 at 09:31 PM. Any idea if Bristol Ridge silicon is actually different to Carrizo? The concerning bit is Promontory (a name I think refers to the chipset/platform) which was targeted at January. But then it surely doesn't make a ton of sense to release motherboards half a year before any CPUs are available? Maybe they're just shipping them to motherboard manufacturers for preparation now? I'm pretty sure my old Phenom II X4 reported different frequencies on the different cores. Oddly, the piledrivers and later certainly do though clocking the two halves of a module seems an interesting trick but monitoring tools (and cat /proc/cpuinfo | grep MHz) under Linux seem to often report all cores but one at the minimum frequency. I've noticed some programs reporting different frequencies on some Intel CPUs which I don't think is right, so it could just be the software not reading it properly. That is worrying. I wonder if they have a chicken/egg situation where people won't build motherboards until there is Zen to put on them, but AMD won't want to introduce Zen with no motherboards around. It was very odd that those new AM3+ and FM2+ motherboards came out recently. Seriously, who cares at this point about FM2+. No, it was a quad core. It couldn't turbo, it could only clock down. Thinking I will have to fire up Linux on my wife's machine now to make sure I am remembering it right I have been on Piledriver for some time now.